After the normal delays, Backspace will be opening on this Sunday. Chef-owner Shawn Cirkiel, of Parkside fame, is going old-school with his new restaurant. 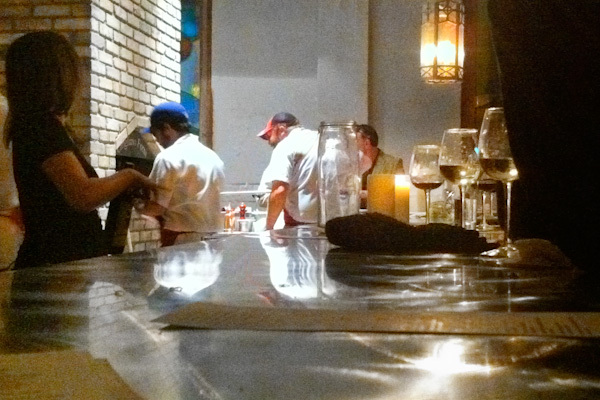 A wood fired oven handles all the cooking duties in the sparse, small space just off Sixth Street. Roasted vegetables, octopus, baked ricotta and the center piece of the menu, pizza. Soft, puffy, Neapolitan style pie tastes promising. Reasonably priced menu items. Clean, simple flavors. Looking forward to hanging out there more, not looking forward to parking that close to to the Chuggin Monkey. UPDATE: Sunday’s (12/12/2010) opening date has come and gone and permit issues continue. Backspace is not open yet. Check out the menu. Thank you for the post. I was so bummed to miss the dinner Tuesday night, but we had a prior commitment. Looking forward to possibly going today, any idea what time they may open?